Average saturated fat intake and coronary heart disease rates in the 16 cohorts - Seven Countries Study | The first study to relate diet with cardiovascular disease. The average population intake of saturated fat varied between 3% of energy in Japan and 22% of energy in Eastern Finland in the 1960s. There was also a 6-fold range in 25-year CHD mortality rates among the 16 cohorts. The average saturated fat intake at baseline was strongly correlated with 25-year CHD mortality rates. 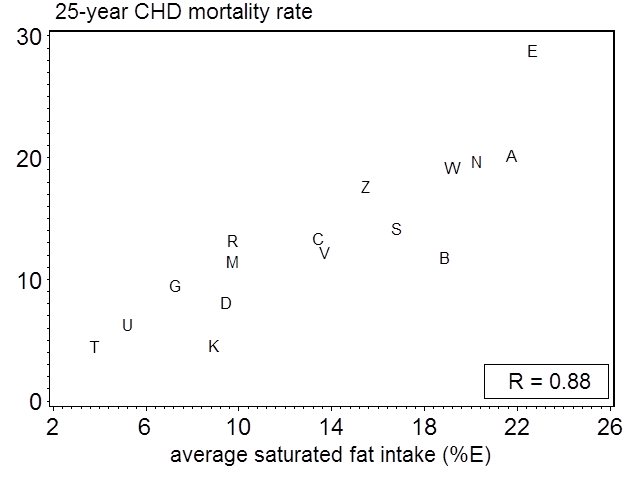 The higher the saturated fat intake, the higher the CHD mortality rate. 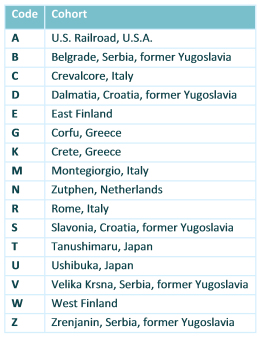 The dietary surveys carried out in the 1960s showed that the most important sources of saturated fat were butter in Finland, hard margarine in The Netherlands and lard in Slavonia (Croatia). Equivalent portions of the foods eaten in 1960s were collected locally for the 16 cohorts in 1987 and were chemically analyzed for fatty acids. This analysis provided more detailed information about the different categories of fatty acids than that carried out in the 1960s.